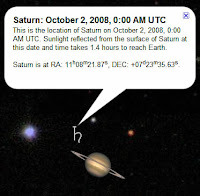 This functionality was not available when Sky launched, but now you can search for planets in our own solar system. For example, if you search for Mars, Sky shows you the planet at its approximate location at the time shown. To do this, in the Search panel, click Search the Sky, enter the appropriate planet name and click the Search button. Learn more about using Sky in the Google Earth user guide. Thx!I truly didn`t know about this thx for posting i gotta go try this out.THx thx thx! !